Byron Kaverman may originally be from Columbus, Ohio. But his real home over the past four years has been living out of a suitcase in various hotel rooms and rented apartments all over the country and the world, playing poker and entering major tournaments. Prior to the 37th gold bracelet event on the 2015 World Series of Poker schedule, Kaverman earned more than $4.2 million in live tournament winnings alone, not counting his massive wins in online tournaments which occurred mostly between 2004 and 2010. 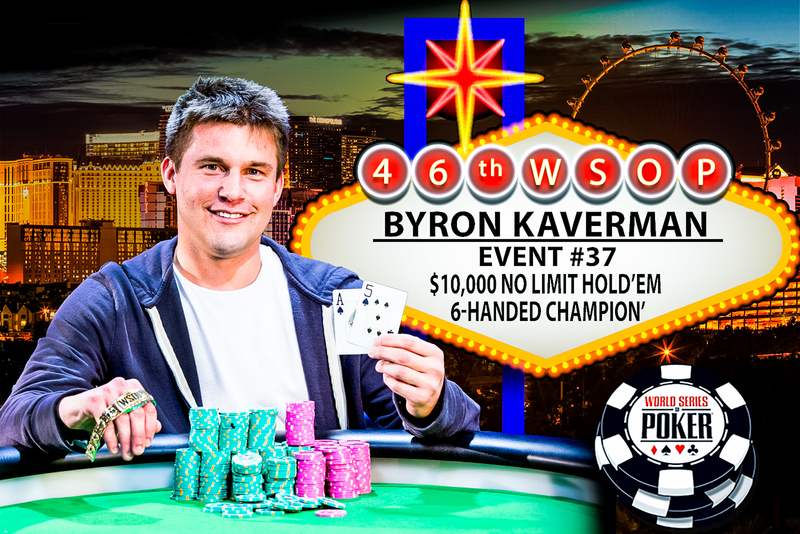 Yet for all his poker success, Kaverman had not until this memorable date enjoyed widespread public acclaim and recognition apart from a win at a preliminary PCA event in the Bahamas held a few years ago and two big wins at the Aria’s High Roller series earlier this year. In short, Kaverman seemed way overdue for a big time victory that would put him into the same category with many of his peers, with gold bracelets. He finally got his due, in one of the most prestigious events in tournament poker. Of all the 68 gold bracelet tournaments on the 2015 World Series of Poker schedule, player for player, the $10,000 buy-in Six-Handed No-Limit Hold’em event may be very the toughest. However, Kaverman didn’t seem to have much trouble with such a blistering field of opponents, coming out on top in the 37th tournament of this year’s summer series. The poker pro conquered a field of 259 players, absolutely loaded to the rafters with online pros, high-stakes cash game players, and former gold bracelet winners. He collected $657,351 for first place. This was one of the best paydays ever for the tournament veteran who has experiences most of the highs and lows the game has to offer over his 11-year career as a full-time player. The tournament was played over three days, concluding on the ESPN Main Stage, which was live streamed over WSOP.com. This marked Kaverman’s 20th time to cash at the WSOP, and second final table appearance this year after taking 9th place in a previous event. Kaverman’s tournament resume is certainly loaded with cashes and deep runs, but this victory was undoubtedly the most prestigious of all, and long overdue. 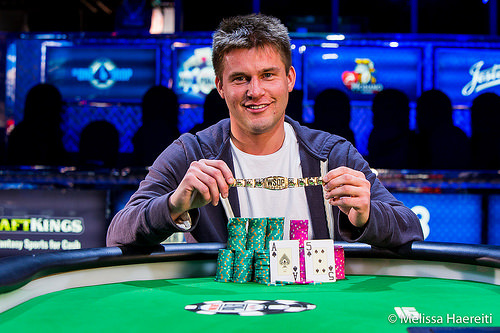 The final table included three gold bracelet winners – Doug Polk, Paul Volpe, and the latest inductee into the fraternity of winners, Sam Greenwood, who won his first title last week. However, none of these journeymen could out-muscle Kaverman off his chip stack. Kaverman was clearly moved by the deep sense of accomplishment, particularly after coming so close in other events, particularly a big World Poker Tour championship a few years ago in which he came in second. With this victory, he moves to in excess of $1.1 million in WSOP earnings, and close to $5 million overall in live tournament events. That doesn’t even count his online feats. The runner up was equally compelling for what he’s done in poker in recent years. Doug Polk, the second-place finisher is perhaps best known as a short-handed and heads-up specialist. A few months ago, he completed in the widely-covered match of “Brains versus Machines” put on by Carnegie Mellon University in Pittsburgh. Polk and a group of three other poker players defeated the software program which was thought might revolutionize poker and perhaps even post a threat to the game’s future existence. However, his opponent his time (Kaverman) proved to be better than any machine developed by a math professor. This was Polk’s third cash of the series. Also worth noting was Paul Volpe’s sixth-place finish. He’s the first player of this year’s series to make three final table appearances (2nd, 2nd, and now 6th). This was his fifth cash at the 2015 series, putting him in increasingly better position to win WSOP “Player of the Year honors.” He’s now won more than $500,000 although he’s yet to win a second gold bracelet. Volpe picked up his first WSOP win last year and is arguably the hottest player at this series over the past two years. Second Place: Doug Polk, a poker pro from Las Vegas finished in 2nd place. He now has 8 WSOP cashes, and more than $750,000 in winnings. Polk won his gold bracelet last year in the Turbo NLHE event. This time, he actually earned more money for this second-place finish, which paid out $406,261. Third Place: Fedor Holz, originally from Germany and now living in Vienna, Austria ended up in 3rd place following a seven-hour stay at the finale table. Holz, age 27, was in serious contention for a while, but went card dead against two aggressive opponents and was eliminated with a payout totaling $268,463. Fourth Place: Thomas Muehloecker, from Vienna Austria finished in 4th place. He’s a 28-year-old poker pro who made his ninth WSOP cash, achieving the highest payout of his career at $182,448. Muehloecker has now cashed at least once each year at the series since 2012. Fifth Place: Sam Greenwood is enjoying a breakout WSOP this year, with four cashes, two final table appearances, and one win. He finished 5th in this tournament, after hovering around the chip lead during days two and three. Greenwood, from Toronto, won the $1K buy-in NLHE tourney just a week earlier and came close to a second gold bracelet victory. Instead, he settled for $126,745 in prize money. Sixth Place: Paul Volpe finished in 6th place. The Philadelphia-based poker pro is having a huge WSOP, this being his fifth time to cash in 2015. Volpe added $89,984 to his poker bankroll and continued to increase his position in contention for the Player of the Year honors. Seventh Place: Rounding out the official final table for this format was Kenneth Fishman, the owner of a mattress company from Tampa, FL. Fishman had a somber time during the finale, getting knocked out fairly quickly after the table finalists were established. He’s married with 4 children. This marked Fishman’s fourth WSOP in-the-money finish. He came in 5th place in an event two years ago. An interesting side note: Fishman was previously a professional bowler who was on tour. Aside from the final table finishers, other gold bracelet winning players and notables who cashed in the top 20 included – 10th -- Chris Klodnicki (runner up in One Drop event two years ago); 11th -- Kevin Song (1997 gold bracelet winner); 12th -- two-time gold bracelet winner Mark Radoja; 12th -- Sam Stein (1 win); and 14th -- Kory Kilpatrick (1 win). Rouding out the in-the-money list were -- 2010 world champion Jonathan Duhamel (1 win), Bertrand “Elky” Grospellier (1 win); Jeremy Ausmus (1 win); and Phil Galfond (2 wins). Doug Polk moves all in on the button for just shy of 1 million chips and Byron Kaverman calls. Their respective rails stand up and being to shout as the cards are tabled. Polk shows and needs to find some help against Kaverman's . 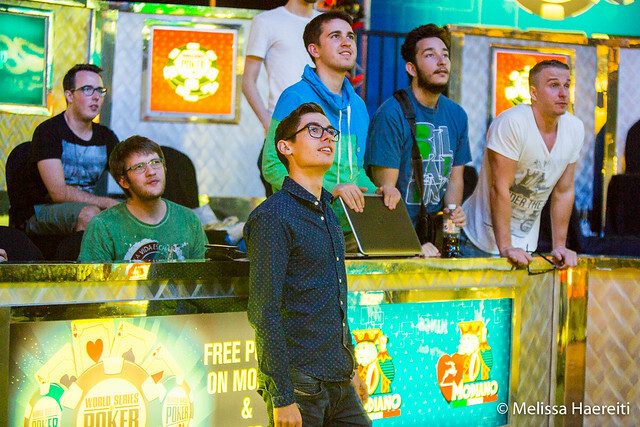 Both players head to the rails and the spectators begin to shout for certain cards. The dealer spreads a flop of , giving Kaverman a pair of fives and keeping him in the lead. Polk's rail shouts for a queen as the dealer burns and turns. The falls on the turn, leaving Polk with six outs. Those six outs stand between Kaverman and his first bracelet. The falls on the river and Kaverman's rail explodes with excitement. Polk and Kaverman exchange handshakes as the tournament is over and Kaverman collects his first career WSOP Bracelet along with $657,351. Polk finishes just shy of his second career bracelet and takes home $406,261 for his runner up finish in the tournament. Byron Kaverman limps in on the button and Doug Polk goes all in from the big blind. Kaverman folds and Polk takes the pot. Doug Polk limps in on the button and Byron Kaverman checks his option. The flop is and Byron Kaverman checks. Doug Polk bets 50,000 and Kaverman check-calls. The rest of the action is checked down as the board is completed with the and the . Kaverman shows Jh8d, giving him a pair of jacks and Polk mucks his hand. Byron Kaverman raises to 110,000 on the button and Doug Polk folds. Doug Polk limps in on the button. Byron Kaverman moves all in and Doug Polk folds. Doug Polk limps in on the button and Byron Kaverman checks his option. The flop is and Kaverman checks. Polk bets 50,000 and Kaverman check-raises to 150,000. Polk calls and they see the fall on the turn. Kaverman checks and Polk goes all in. Kaverman folds and Polk drags the pot. Byron Kaverman raises to 125,000 on the button and Doug Polk calls out of the big blind. The flop is and Polk checks. Kaverman bets 150,000 and Polk check-calls. The turn is the and Polk checks again. Kaverman bets 325,000 and Polk check-calls again. The river is the and Polk checks again. Kaverman sits motionless for two minutes and then bets 1,100,000. Polk snap-calls and Kaverman shows , giving him the nut straight and Polk mucks his hand. Doug Polk raises on the button to 110,000 and takes the blinds and antes. Byron Kaverman raises to 105,000 on the button and Doug Polk defends his big blind. The flop is and both players check. The turn is the and both players check again. The river is the and Polk leads out for 580,000. Kaverman calls and they chop it up as they both play the board. Polk tables and Kaverman tables and they each get half the pot. Doug Polk folds his button and Byron Kaverman moves all in from the small blind. Fedor Holz calls off his roughly 400,000 chip stack and the cards are tabled. Kaverman shows and is in the lead against Holz's . Holz gets up from the table and heads to his rail to sweat the board on the big screen above the table. With Holz's entire rail yelling for a king, the flop comes , giving Kaverman a pair of fives and an even bigger advantage in the hand. The turn is the and Holz is down to his last card to hit a king. Holz's rail lets out a moan of disgust as the hits the river and Holz is eliminated in third place. With Holz's elimination Kaverman takes better than a 2-to-1 chip lead at the start of his heads-up match with Doug Polk. Byron Kaverman gets a walk. Byron Kaverman raises to 125,000 and wins the blinds and antes. 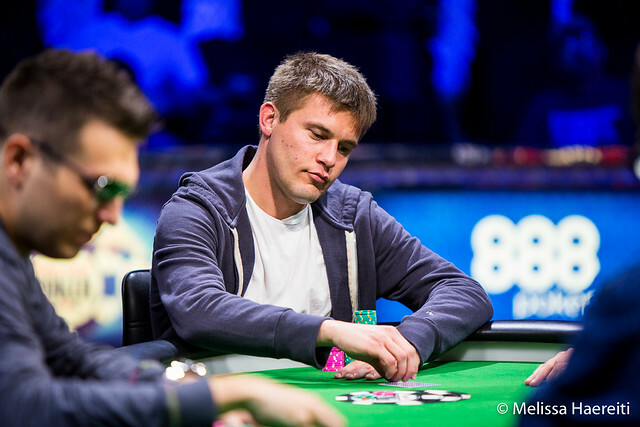 Byron Kaverman moves all in from the small blind and Fedor Holz folds. The final three players are taking a 60 minute dinner break. Fedor Holz moves all in from the button and takes the blinds and antes. Byron Kaverman raises to 100,000 from the button and Doug Polk calls from the big blind. The flop is and Polk checks. Kaverman bets 80,000 and Polk check-calls. The turn is the and Polk leads out for 80,000. Kaverman calls and the river is the . Both players check and Polk shows , giving him jack-high and Kaverman wins the pot with his . Doug Polk raises to 90,000 from the button and Fedor Holz calls from the big blind. The flop is and Holz checks. Polk bets 80,000 and Holz check-folds.